Indulge your favorite epicure or yourself with The Connoisseur Gift Basket filled with a delectable assortment of our award-winning products. You will receive 8 ounces of our velvety foie gras mousse, one bottle of Italian fig syrup, and petit toasts. You will also receive 2 smoked magret duck breasts and 6 rustic duck legs, cooked confit style. Our products will arrive gift-wrapped in an elegant keepsake basket of hunter green metal mesh and dark wood trim. All products are fully cooked and ready to enjoy. The Connoisseur Basket is a sophisticated gift well worth the splurge. All products are also sold separately. The Deluxe Basket includes contents of the Connoisseur Basket plus one fresh whole Grade-A 1.5 lb Foie Gras. Indulge your favorite epicure or yourself with The Connoisseur Gift Basket filled with a delectable assortment of our award-winning products. You will receive 8 ounces of our velvety foie gras mousse, one bottle of Italian fig syrup, and petit toasts. You will also receive 2 smoked magret duck breasts and 6 rustic duck legs, cooked confit style. Our products will arrive gift-wrapped in an elegant keepsake basket of hunter green metal mesh and dark wood trim. All products are fully cooked and ready to enjoy. The Connoisseur Basket is a sophisticated gift well worth the splurge. All products are also sold separately. 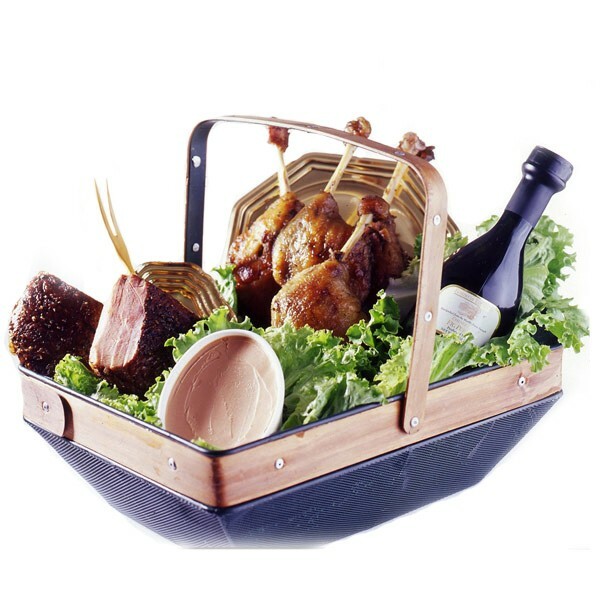 The Deluxe Basket includes contents of the Connoisseur Basket plus one fresh whole Grade-A 1.5 lb Foie Gras.